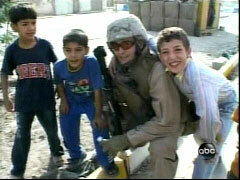 Lt. General Raymond Ordierno on Thursday reported significant progress in reduced violence in Iraq, but of the broadcast network evening newscasts only ABC's World News bothered to cover the positive trend as anchor Charles Gibson introduced a full story on how “military officials gave one of the most upbeat assessments of the security situation in Iraq that we have heard since the opening months of the war.” The CBS Evening News* and NBC Nightly skipped the positive trend, but CBS had time for a story on the investigation of the September shooting of civilians by Blackwater and NBC aired a piece on Hillary Clinton “playing the gender card.” The Washington Post and New York Times on Friday also made very different news judgments on the importance of the positive direction as the Post put the news on its front page while the Times hid it in a story, on an inside page, about Iran's role in Iraq. A PDF of a transcript of the November 1 briefing by Odierno, commander of multi-national forces in Iraq. 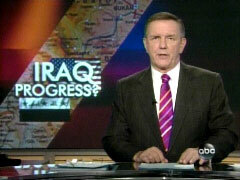 A rare upbeat story on Iraq ran Monday night on ABC's World News. 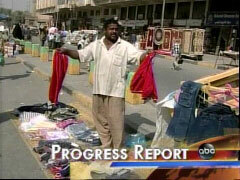 Anchor Charles Gibson touted "an extraordinary comeback story" about Fallujah, the city of one of the war's bloodiest and longest battles, but now where reporter Miguel Marquez discovered bustling markets, Marines welcomed by kids and no car bombs or shootings of Marines in several months. Gibson effused about how "we have an extraordinary comeback story tonight from the place where the Marines suffered their worst losses of the war. Fallujah is undergoing a remarkable turnaround. Tribal leaders, local officials and the U.S. Marines have united behind a common cause. Bringing security to a place that had been one of Iraq's most insecure." Over matching video, Marquez described how "the markets bustle. Traffic chokes the streets. Marines, once despised here, are now a welcome sight." Viewers saw video of a Marines with kids before Colonel Rich Simcook told Marquez: "This is one of my big measures of effectiveness, where, you know, kids will come up to you, you know, they feel safe to come out and play." Speaking with a Marine Sergeant, Marquez wondered: "When's the last time you were shot at these days?" The Marine replied: "I'd say, end of March." Marquez saw a corollary sign things are going well: "The last car bomb in Fallujah was in May." Though Marquez added some caveats about high unemployment and the lack of weapons for the Iraqi police, he concluded on the bright side: "There are encouraging signs. Schools just opened, and enrollment is at its highest since before the war. Construction, from huge infrastructure projects to fixing sidewalks, is everywhere. Fallujah even sports solar street lights..."
CHARLES GIBSON: At the Pentagon today, military officials gave one of the most upbeat assessments of the security situation in Iraq that we have heard since the opening months of the war. 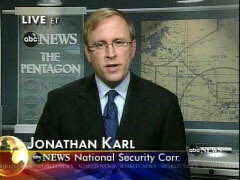 And Jonathan Karl is at the Pentagon tonight. Jon? JONATHAN KARL: Charlie, nobody over here is anywhere near ready to declare victory, but the military statistics tell an unmistakable story. Violence in Iraq is down, and down considerably. Baghdad's marketplaces are slowly coming back to life, as violent attacks in Iraq have fallen to less than half of what they were a year ago. Until recently, the trends had been deadly and consistent, violence steadily increasing to an all-time high in June. 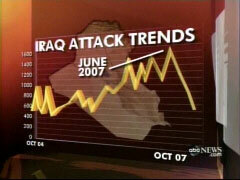 Since then, however, attacks have fallen four straight months in every category. LIEUTENANT GENERAL RAYMOND ODIERNO, MULTI-NATIONAL FORCE IN IRAQ: What I'm confident about is the progress we're making, I think, is real. 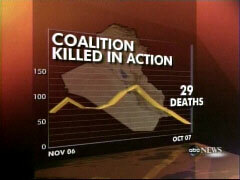 KARL: Roadside bombs fell in October to an average of 20 a day -- still high, but the lowest level since October 2004. Iraqi civilian deaths have fallen to a third of where they were a year ago. And after the deadliest summer ever for U.S. forces in Iraq, U.S. combat deaths fell to 29 last month, the lowest level in more than three years. MICHAEL O'HANLON, BROOKINGS INSTITUTION: The fact that we're seeing a durable trend over half a year time period tells us something real is going on. It doesn't mean, however, that it's guaranteed to last. And it doesn't answer the questions about political progress. ROBERT GATES, DEFENSE SECRETARY: I think those end up being loaded words. I think we have been very successful. We need to continue being successful. KARL: Today Defense Secretary Gates said that the reduction in violence would not have been possible without the surge of 30,000 additional troops into Iraq. But, Charlie, those troops are going home in the coming months, raising the question of whether the violence will go up when they leave.